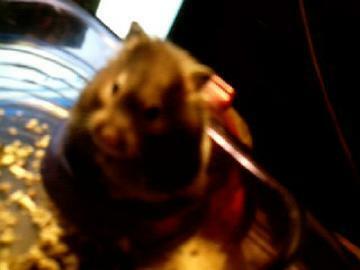 My Chinese hamster that is name Bear. This page is all about my hamsters names, age and everything like that! Bear: he is a Chinese hamster (born in Dec. year 2004). Cherrio: one year old female (born 3/03/05) and is housed with her mother Fluffy. 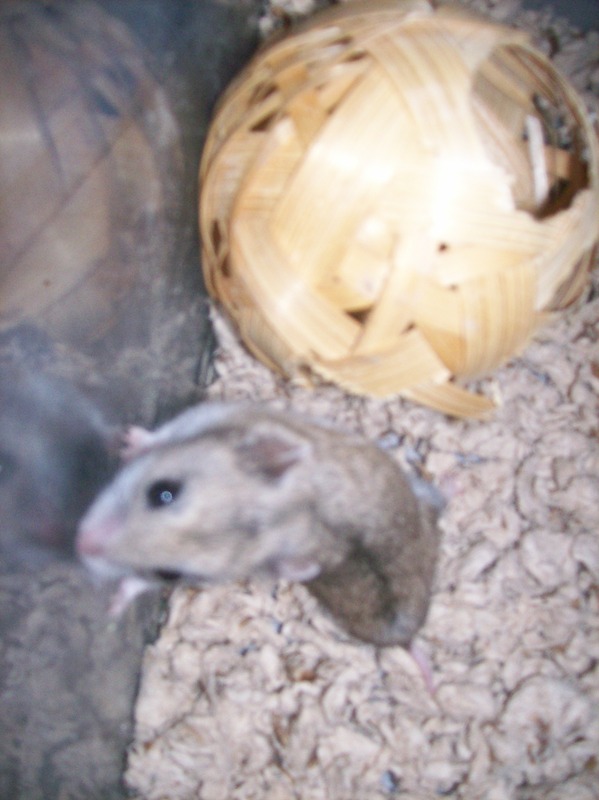 Anna: She came to me on 5/18/05 and she is a Golden hamster. Midnight: I got him on 9/2/05 and he is a Black Bear hamster. Cotton: She is a gerbil that came to me on 2/15/06 because somebody dump her and her cage out at this dump that I got a call about so I took her and kept her so now she got a home and she is so sweet. Snapper: I remember the joy Snapper was for the hold year I had her, she was my first hamster but she passed away of old age on 1/8/05. Fluffy: I remember the joy Fluffy was and the fun times we had together and she was my third hamster but she passed away of old age on 10/30/05. Oreo: I remember the joy Oreo was, he been with me sent the day he was born and was housed with his brother Baby until the day he passed away of old age on 03/14/06 and he was 1 1/2 years old and was going to be 2 years old on 04/03/06. Baby: I remember the joy Baby was, he was another one that was with me sent the day he was born and was housed with Oreo until the day Oreo passed away of old age and he passed away of old age on 09/05/06. Angel: I remember the joy that Angel was, she was born with Baby and Oreo and passed away of old age on 09/11/06. Alex: I remember the joy that Alex was, he live a good long life of three years old and he passed away of old age on 11/14/06. Cherrio: I remember the joy that Cherrio was, she was one year old but passed away in her sleep without any pain, I found her just laying in her cage but she been with me sent the day she was born, she was the daughter of Fluffy and Alex and she passed away on 01/15/07. R.I.P Oreo (The brown and white one) and Baby (The tann one) I will missed yall! R.I.P Angel and I will missed you! R.I.P Alex and I will missed you! R.I.P Cherrio and I will missed you!